Ensure that Bluetooth is on. Turn on the Bluetooth gizmo or ensure that its Bluetooth radio is on. Some Bluetooth devices have separate power and Bluetooth switches. On the Galaxy Tab, touch the Apps Menu button on the Home screen and run the Settings app. The Bluetooth Settings window appears. If the other device has an option to become visible, select it. Eventually, the device should appear on the Bluetooth Settings window. If necessary, input the device’s passcode or otherwise acknowledge the connection. Not every device has a passcode. If prompted, acknowledge the passcode on either the Galaxy Tab or the other device. After you acknowledge the passcode (or not), the Bluetooth gizmo and your Galaxy Tab are connected and communicating. You can begin using the device. Connected devices appear on the Bluetooth Settings window, at the bottom under the heading Paired Devices. 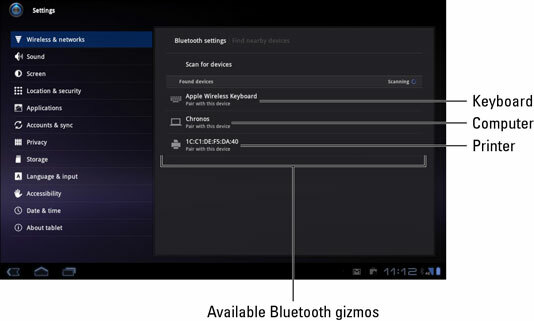 To break the connection, you can either turn off the gizmo or disable the Bluetooth radio on your Galaxy Tab. Because the devices are paired, when you turn on Bluetooth and reactivate the device, the connection is instantly reestablished. How you use the device depends on what it does. For example, the keyboard can be used for text input, the computer can be accessed for sharing files, and the printer can be used for printing documents or pictures. You can unpair a device by choosing it from the Bluetooth Settings window. Choose the Unpair command to break the Bluetooth connection and stop using the device. Only unpair devices you don’t plan on using again in the future. Otherwise, simply turn off the Bluetooth device. Bluetooth can use a lot of power. Especially for battery-powered devices, don’t forget to turn them off when you’re no longer using them with the Galaxy Tab.